I read the cell spot mini tower is a better option, but you need to have an internet connection to use it. We are using the LG K20 as a hot spot, so that would not work for us. Any suggestions?? Welcome to T-Mobile! Having a stronger signal inside your home is a must and you definitely took the right path with getting a signal booster. It sounds like the set-up may not be complete even though it's registered (which I'm glad you went ahead and did). Can you take a look at the .pdf file at the bottom of this link? It'll take you through all of the set-up steps. Please let me know once you've completed the set-up per the .pdf file and what color lights you see on the signal booster afterwards. I appreciate the information you've provided. I would like to take a look at what your mobile device is picking up. Please see image below, this is an example of what I'm looking for. Please label each image WU-ON, CU-ON and CU-OFF. This will allow me to see what your mobile device is doing. Next we tried the following and ended up determining my window unit is defective. I am in the process now of getting a replacement unit once I process my return through Amazon. I appreciate you sending over the images. The signal at the WU in the images appears to be jumping around from -116 dBm to -117 dBm. The threshold for LTE signal is -120 dBm anything close to -120 dBm or around this signal strength is considered to be too weak to boost. I suggest you use the LTE discovery app to locate a better signal for your WU, preferably below -109 dBm. Once you've located a better incoming signal, perform a test call and make sure you have no call audio issues. Then proceed to relocate the WU there. Please note that Cel-Fi systems require at least one bar of usable signal, meaning you have to be able to make and hold a call at any given location without any issues. Having 1 bar of signal at the NU is not concerning as long as you are able to make and hold a call there without any issues. If you've relocated the WU and you are still having issues it can be that the WU is defective. Lets try the above and see if we can get the WU to pick up a signal, we will then go from there. Wow, I've definitely learned something from this! Thank you so much for posting the entire conversation as I think it will be helpful for others that may encounter the same situation. Yes, please keep this thread updated with the outcome of the exchange! I'm eager to hear if replacing the coverage device is the solution. Perfect! That's interesting that you had to go through a refund then repurchase the device but if that does the trick...! By the way, thanks for staying active on this thread and keeping us updated. Maybe you can answer a question for me though. I am currently using one of my phones for a hotspot. I am currently paying the extra $25 for unlimited data when using it as a hotspot. I am wondering if I should purchase one of your mobile hotspots and move that $25 to the hotspot device. Would this require me to pay for an additional line to activate the hotspot device?? I'm bummed to hear that the Cel-Fi isn't going to work out. Although, I'm happy to see that Rosa has been a huge help. As far as hotspot goes, it would considered an additional line, but in most cases, you would receive a $10 discount off the the cost of that line. Wow, that sounds like quite the antenna, Mike! I'm sure the Cel-Fi would've save a lot of time from the sounds of how intense the installation for this new booster is. Yes, please let me know how it goes! Fingers crossed that all the hard work pays off. Without the booster I was getting 1-2 bars of signal @ -120 to -109 db strength in most areas of the house. Now with the booster, I am seeing 4-5 bars @ -92 to -84 db so I am very pleased to be able to go anywhere in the house and use the phones. I followed the recommended installation guidelines and the outside antenna is located about 35 feet horizontally and 15 feet vertically from the inside unit. For the price, the unit preforms very well and although I am not seeing the advertised 65 db gain, I believe that is because I am about 6 miles from the tower and there are quite a few trees that interfere with direct line of sight. That's fantastic news, Mike! Foliage can certainly interfere with a signal but it sounds like this booster is helping out a lot. Thanks again for keeping me updated! Are you aware that T-Mobile will send you a free booster if you just call them? Cel-fi user here. Just wanted to respond that Rosa's recipe worked like a charm for me. I downloaded LTE Discovery, and realized my Network Unit was poorly sited. I moved it a little closer to the window and signal strength went from -114dB to -92dB. After carefully restarting the Network Unit and then the Coverage Unit, my Coverage Unit now shows LTE mode as "Boosting" via the Wave app. Near my Coverage Unit, LTE strength has gone from -108dB to -72dB. LTE Discovery app is the key here. Really lets you see what's going on and how to fix it. Thanks, Rosa! Hey Mike - sounds like I have nearly the same situation. Thanks so much for the information. 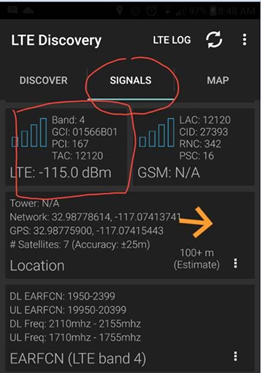 Is the signal booster you eventually bought and installed still working well for you and your t-mobile LG K20 plus phone and internet hotspot? If so - I'll look to purchase your suggested item. See my post from earlier today in a different thread where someone else was asking when T-mobile will provide a band 12 compatible signal booster for their customers in limited service areas like ours. While this thread is getting old, it speaks to the issue I just faced in the past few days. So thought I share this in case it helps others going down this 'rat hole'. Have a new T-mobile LG K20 Plus (been a t-mobile customer for all of 1 week) and phone gets 3-4 bars (-109 dBm) LTE 4G Band 12 service in 1 window of the house. I'm planning to disconnecting my very slow DSL Verizon internet as soon as I work through this reception issue. With phone in the window and setup as a hotspot, I'm getting decent download speeds of up to 14.11 Mbps - upload speed and rather poor at 1.7Mbps. But I can't keep the phone in the window the res of my life. So order the Signal booster ( one w/o the internet) and after t-mobile ordered the wrong one, I received the correct unit yesterday (Appreciate that T-mobile waived the $25 security deposit and shipping costs). Was all excited - plugged in the window unit, self-test seemed to pass, then green power light just sat there blinking green over an over for hours. Never picked up a signal. After looking at this forum, it turns out that these 'free' boosters do NOT support T-mobile band 12, and that is the only t-mobile service I can pick up at my home. I called technical support this morning and the tech verified that they only support bands 2 & 4 and he did not know of any plans to update their units with a Nextivity model that supports band 12. So although T-mobile was will to send me another Signal Booster Unit thinking that perhaps the last one was defective, I canceled that order since it appears this unit will not work with the current T-mobile coverage at my house. I suggest T-mobile ask their customers to determine what 4G LTE service they are receiving before wasting time and money (mine and theirs) sending out these units to people like me who only have band 12 available in their area. T-mobile is launching band 71 and also has band 66, so why aren't their boosters keeping up with their network technology? UNthinkable John Legere (CEO of T-Mobile).